Nanodiamonds, as observed with a transmission electron microscope. In nanotechnology, a particle is defined as a small object that behaves as a whole unit in terms of its transport and properties. Particles are classified in terms of their size. Thus, "fine particles" are those with diameters in the range of 100 to 2500 nanometers (nm), while "ultrafine particles" have diameters between 1 and 100 nanometers. Like ultrafine particles, nanoparticles are defined as having diameters between 1 and 100 nanometers, although the size limitation can be restricted to two dimensions. At the small end of the size range, nanoparticles are often referred to as clusters. In addition, nanospheres, nanorods, and nanocups are a few of the shapes that have been grown. Metal, dielectric, and semiconductor nanoparticles have been prepared, as well as hybrid structures (such as core-shell nanoparticles). Nanoparticles made of semiconducting material may also be labeled quantum dots if they are small enough (typically below 10 nm) that quantization of electronic energy levels occurs. Semi-solid and soft nanoparticles have been manufactured. A prototype nanoparticle of semi-solid nature is the liposome. Nanoparticle research is currently an area of intense scientific research, due to a wide variety of potential applications in biomedical, optical, and electronic fields. The National Nanotechnology Initiative has led to generous public funding for nanoparticle research in the United States. Various types of nanoparticles are currently used clinically as delivery systems for anticancer drugs and vaccines, or as imaging agents. Although generally nanoparticles are considered an invention of modern science, they actually have a very long history. Specifically, nanoparticles were used by artisans as far back as the ninth century Mesopotamia for generating a glittering effect on the surface of pot. Even these days, pottery from the Middle Ages and Renaissance often retains a distinct gold or copper colored metallic glitter. This so called luster is caused by a metallic film that was applied to the transparent surface of a glazing. The luster can still be visible if the film has resisted atmospheric oxidation and other weathering. 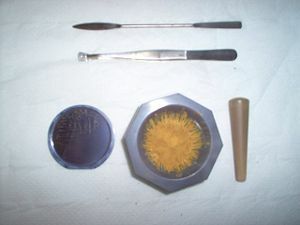 The luster originates within the film itself, which contains silver and copper nanoparticles, dispersed homogeneously in the glassy matrix of the ceramic glaze. These nanoparticles were created by the artisans by adding copper and silver salts and oxides, together with vinegar, ocher, and clay, on the surface of previously-glazed pottery. The object was then placed to a kiln and heated to about 600°C in a reducing atmosphere. In the heat the glaze would soften, causing the copper and silver ions to migrate into the outer layers of the glaze. There the reducing atmosphere reduced the ions back to metals, which then came together forming the nanoparticles that give the color and optical effects. Luster technique shows that craftsmen had a rather sophisticated empirical knowledge of materials. The technique originates in the Islamic world. As Muslims were not allowed to use gold in artistic representations, they had to find a way to create a similar effect without using real gold. The solution they found was to use luster. Michael Faraday provided the first description, in scientific terms, of the optical properties of nanometer-scale metals in his classic 1857 paper "Experimental relations of gold (and other metals) to light." Much of the modern day studies of these objects have been conducted at the ESRF laboratory. Several techniques were used to characterize the chemical and physical properties of these luster, such as Rutherford Backscattering Spectrometry (RBS), optical absorption in the visible-ultraviolet region, electron microscopy (TEM and SEM). Nanoclusters have at least one dimension between 1 and 10 nanometers and a narrow size distribution. Nanopowders are agglomerates of ultrafine particles, nanoparticles, or nanoclusters. Nanometer sized single crystals, or single-domain ultrafine particles, are often referred to as nanocrystals. The term NanoCrystal® is a registered trademark of Elan Pharma International (EPIL) used in relation to EPIL’s proprietary milling process and nanoparticulate drug formulations. The properties of materials change as their size approaches the nanoscale and as the percentage of atoms at the surface of a material becomes significant. For bulk materials larger than one micrometer the percentage of atoms at the surface is minuscule relative to the total number of atoms of the material. The interesting and sometimes unexpected properties of nanoparticles are partly due to the aspects of the surface of the material dominating the properties in lieu of the bulk properties. Nanoparticles may or may not exhibit size-related intensive properties that differ significantly from those observed in fine particles or bulk materials. They do exhibit a number of special properties that differ from those of bulk materials. For example, the bending of bulk copper (wire, ribbon, and so on) occurs with movement of copper atoms/clusters at about the 50 nm scale. Copper nanoparticles smaller than 50 nm are considered super hard materials that do not exhibit the same malleability and ductility as bulk copper. The change in properties is not always desirable. Ferroelectric materials smaller than 10 nm can switch their magnetization direction using room temperature thermal energy, thus making them useless for memory storage. Suspensions of nanoparticles are possible because the interaction of the particle surface with the solvent is strong enough to overcome differences in density, which usually result in a material either sinking or floating in a liquid. Nanoparticles often have unexpected visible properties because they are small enough to confine their electrons and produce quantum effects. For example gold nanoparticles appear deep red to black in solution. Nanoparticles have a very high surface area to volume ratio. This provides a tremendous driving force for diffusion, especially at elevated temperatures. Sintering can take place at lower temperatures, over shorter time scales than for larger particles. This theoretically does not affect the density of the final product, though flow difficulties and the tendency of nanoparticles to agglomerate complicates matters. The large surface area to volume ratio also reduces the incipient melting temperature of nanoparticles. Moreover nanoparticles have been found to impart some extra properties to various day to day products. Like the presence of titanium dioxide nanoparticles impart what we call as the self-cleaning effect, and the size being nanorange, the particles can't be seen. Nano Zinc Oxide particles have been found to have superior UV blocking properties compared to its bulk substitute. This is one of the reasons why it is often used in the sunscreen lotions. Clay nanoparticles when incorporated into polymer matrices increase re-inforcement, leading to stronger plastics, verified by a higher glass transition temperature and other mechanical property tests. These nanoparticles are hard, and impart their properties to the polymer (plastic). Nanoparticles have also been attached to textile fibers in order to create smart and functional clothing. Scientists have taken to naming their particles after the real world shapes that they might represent. Nanospheres, nanoreefs, nanoboxes, and more have appeared in the literature. These morphologies sometimes arise spontaneously as an effect of a templating or directing agent present in the synthesis such as micellular emulsions or anodized alumina pores, or from the innate crystallographic growth patterns of the materials themselves. Some of these morphologies may serve a purpose, such as long carbon nanotubes being used to bridge an electrical junction, or just a scientific curiosity like the stars shown at left. Nanoparticle characterization is necessary to establish understanding and control of nanoparticle synthesis and applications. Characterization is done by using a variety of different techniques, mainly drawn from materials science. Common techniques are electron microscopy (transmission electron microscopy (TEM) and scanning electron microscopy (SEM)), atomic force microscopy (AFM), dynamic light scattering (DLS), x-ray photoelectron spectroscopy (XPS), powder x-ray diffractometry (XRD), Fourier transform infrared spectroscopy (FTIR), Matrix-Assisted Laser-Desorption Time-of-flight mass spectrometry (MALDI-TOF), and Ultraviolet-visible spectroscopy. Although the theory of Brownian motion has been known for over a century, the technology for Nanoparticle tracking analysis (NTA) allows direct tracking of the Brownian motion, and this method therefore allows the sizing of individual nanoparticles in solution. There are several methods for creating nanoparticles; attrition and pyrolysis are common methods. In attrition, macro or micro scale particles are ground in a ball mill, a planetary ball mill, or other size reducing mechanism. 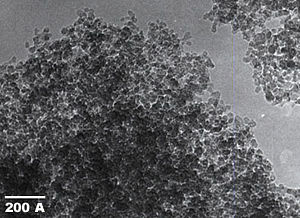 The resulting particles are air classified to recover nanoparticles. In pyrolysis, a vaporous precursor (liquid or gas) is forced through an orifice at high pressure and burned. The resulting solid (a version of soot) is air classified to recover oxide particles from by-product gases. Pyrolysis often results in aggregates and agglomerates rather than singleton primary particles. A thermal plasma can also deliver the energy necessary to cause evaporation of small micrometer size particles. The thermal plasma temperatures are in the order of 10000 K, so that solid powder easily evaporates. Nanoparticles are formed upon cooling while exiting the plasma region. The main types of the thermal plasmas torches used to produce nanoparticles are dc plasma jet, dc arc plasma and radio frequency (RF) induction plasmas. In the arc plasma reactors, the energy necessary for evaporation and reaction is provided by an electric arc which forms between the anode and the cathode. For example, silica sand can be vaporized with an arc plasma at atmospheric pressure. The resulting mixture of plasma gas and silica vapor can be rapidly cooled by quenching with oxygen, thus ensuring the quality of the fumed silica produced. In RF induction plasma torches, energy coupling to the plasma is accomplished through the electromagnetic field generated by the induction coil. The plasma gas does not come in contact with electrodes, thus eliminating possible sources of contamination and allowing the operation of such plasma torches with a wide range of gases including inert, reducing, oxidizing and other corrosive atmospheres. The working frequency is typically between 200 kHz and 40 MHz. Laboratory units run at power levels in the order of 30-50 kW while the large scale industrial units have been tested at power levels up to 1 MW. As the residence time of the injected feed droplets in the plasma is very short it is important that the droplet sizes are small enough in order to obtain complete evaporation. The RF plasma method has been used to synthesize different nanoparticle materials, for example synthesis of various ceramic nanoparticles such as oxides, carbours/carbides, and nitrides of Ti and Si. Inert-gas aggregation is frequently used to make nanoparticles from metals with low melting points. The metal is vaporized in a vacuum chamber and then supercooled with an inert gas stream. The supercooled metal vapor condenses in to nanometer-sized particles, which can be entrained in the inert gas stream and deposited on a substrate or studied in situ. Nanoparticles present possible dangers, both medically and environmentally. Most of these are due to the high surface to volume ratio, which can make the particles very reactive or catalytic. They are also able to pass through cell membranes in organisms, and their interactions with biological systems are relatively unknown. However, free nanoparticles in the environment quickly tend to agglomerate and thus leave the nano-regime, and nature itself presents many nanoparticles to which organisms on earth may have evolved immunity (such as salt particulates from ocean aerosols, terpenes from plants, or dust from volcanic eruptions). According to the San Francisco Chronicle, "Animal studies have shown that some nanoparticles can penetrate cells and tissues, move through the body and brain and cause biochemical damage. They also have shown to cause a risk factor in men for testicular cancer. But whether cosmetics and sunscreens containing nanomaterials pose health risks remains largely unknown, pending completion of long-range studies recently begun by the FDA and other agencies." Diesel nanoparticles have been found to damage the cardiovascular system in a mouse model. Generally, solar cells on the market today do not produce much electricity from ultraviolet light, instead it is either filtered out or absorbed by the cell, heating the cell. That heat is wasted energy and could even lead to damage to the cell. By diluting particles of silicon in alcohol, covering a solar cell with it and letting the alcohol evaporate to leave the nanoparticles of silicon on the cell has been increased the cell power output by 67 percent in the ultraviolet range and about 10 percent in the visible range. ↑ Michael Faraday, Experimental relations of gold (and other metals) to light, Phil. Trans. Roy. Soc. London 147 (1857): 145–181. ↑ 2.0 2.1 B.D. Fahlman, Materials Chemistry (Dordrecht, NL: Springer, 2007, ISBN 9781402061196), 282-283. ↑ ASTM, ASTM E 2456 - 06 Standard Terminology Relating to Nanotechnology. Retrieved November 15, 2008. ↑ P.H. Buffat and J.P. Borel, Size effect on the melting temperature of gold particles, Physical Review A. 13 (6): 2287–2298. Retrieved November 16, 2008. ↑ Agam and Guo, Electron beam modification of polymer nanospheres, Journal of Nanoscience and Nanotechnology 7 (10): 3615-3619. Digital object identifier (DOI): 10.1166/jnn.2007.814 . ↑ J.H. Choy, E.S. Jang, J.H. Won, J.H. Chung, D.J. Jang, and Y.W. Kim, Hydrothermal route to ZnO nanocoral reefs and nanofibers, Appl. Phys. Lett. 84 (2004): 287. ↑ Yugang Sun and Younan Xia, Shape-Controlled Synthesis of Gold and Silver Nanoparticles, Science 298: 2176. Digital object identifier (DOI): 10.1126/science.1077229 . ↑ Catherine Murphy, Nanocubes and Nanoboxes, Science 298 (2002): 2139. Digital object identifier (DOI): 10.1126/science.1080007 . ↑ Anisa Mnyusiwalla, Abdallah S. Daar, and Peter A. Singer, "Mind the gap:" Science and ethics in nanotechnology, Nanotechnology. 14 (2003): R9-R13. Digital object identifier (DOI): 10.1088/0957-4484/14/3/201 . ↑ Jackie Ying, Nanostructured Materials (San Diego, CA: Academic Press, 2001, ISBN 9780120085279). ↑ Europa, Nanotechnologies: 6. What are potential harmful effects of nanoparticles? Retrieved November 15, 2008. ↑ Keay Davidson, FDA urged to limit nanoparticle use in cosmetics and sunscreens, San Francisco Chronicle. Retrieved November 15, 2008. ↑ Adam Satariano, study Pollution Particles Lead to Higher Heart Attack Risk (Update1). Bloomberg.com. Retrieved November 15, 2008. ↑ Jeremy Korzeniewski, Silicon nanoparticle film can increase solar cell performance, Autoblog Green. Retrieved November 15, 2008. Fahlman, B.D. 2007. Materials Chemistry. Dordrecht, NL: Springer. ISBN 9781402061196. Schmid, Günter. 2004. Nanoparticles: From Theory to Application. Weinheim, DE: Wiley-VCH. ISBN 3527305076. Ying, Jackie. 2001. Nanostructured Materials. San Diego, CA: Academic Press. ISBN 9780120085279. Nanotechnologies summary by GreenFacts of the European Commission SCENIHR assessment. This page was last modified on 6 November 2018, at 19:30.